First, have a wonderful prom in your beautiful gown and his handsome tuxedo from NOLEN'S. (2) Afterwards, give us a call to make arrangements for gown packaging and shipping. Of course, if you didn't buy your prom dress from NOLEN'S, it still receives the same special attention. 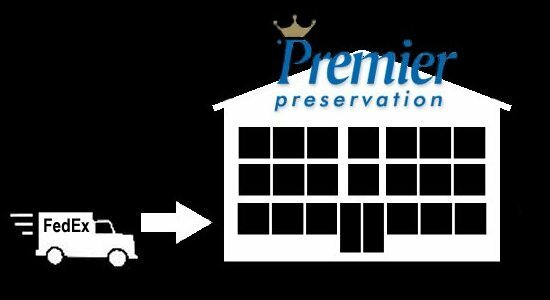 Premier Gown Preservation will take care of everything. Premier is family owned with 45 years of experience in gown preservation. At Premier, your prom dress will be cleaned, steam pressed and wrapped in an acid-free tissue. It is then placed in a personalized acid free chest. Afterwards, your dress is promptly shipped directly back to you in its own personalized acid free storage chest that includes your name and the prom date on the outside of the chest. A single price includes garment preservation along with any related shipping charges. Optional items can be added for a small fee. For extra, you can upgrade to the DIAMOND package, insuring your valuable memory for $1,500.00, along with hand pressing and special garment wrapping in museum style muslin. A keepsake envelope for invitations, photos, etc. is also included. We offer prom dress preservation service. 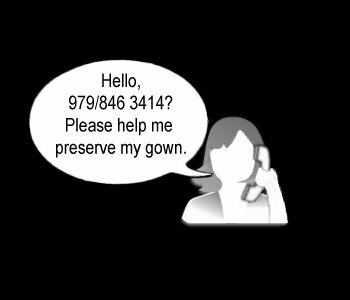 Prom gown preservation services are available in local cities like Bryan, College Station, Brenham, Waco, Austin, TX. 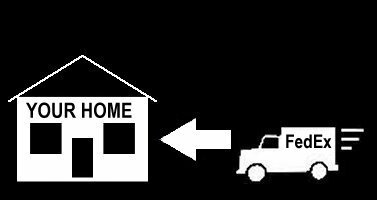 However, since we can service you by phone, we can offer dress preservation in all major US cities like: Seattle, WA, Spokane, WA, San Francisco, CA, San Jose, CA, Oakland, CA, Sacramento, CA, Los Angeles, CA, San Diego, CA, Fresno, CA, Long Beach, CA, Bakersfield, CA, Santa Barbara, CA, Tucson, AZ, Mesa, AZ, Yuma, AZ, Phoenix, AZ, Las Vegas, NV, Albuquerque, NM, Omaha, NB, Cedar City, UT, Salt Lake City, UT, Billings, MT, Casper, WY, El Paso, TX, Huntsville, TX, Lubbock, TX, San Antonio, TX, Houston, TX, Dallas, Fort Worth, TX, Arlington, TX, Kansas City, MO, Tulsa, OK, Oklahoma, City, OK, Sioux Falls, OK, Fargo, ND, New Orleans, LA, Little Rock, AR, Saint Louis, MO, Springfield, MO, Chicago, IL, Milwaukee, WI, Racine, WI, Detroit MI, Indianapolis, IN, Minneapolis, IN, Atlanta, GA, Mobile, AL, Montgomery, AL, Miami, FL, Panama City, FL, Orlando, FL, Melbourne, FL, Jacksonville, FL, Savanna, GA, Charleston, SC, Augusta, GA, Cleveland, OH, Columbus, OH, Louisville, NC, Raleigh, NC, Charlotte, NC, Memphis, TN, Denver, CO, Colorado Springs, CO, Jacksonville, NC, Richmond, VA, Virginia Beach, VA, Fredericksburg, VA, Washington D.C., Harrisburg, PA, New York City, NY, Hartford, CT, Bethesda, MD, Baltimore, MD, Providence, RI, Boston, MA, Albany, NY and Augusta, ME. This page reference is bgp3apechio.